Next-generation Wi-Fi technologies typically usher in a new generation of top-shelf products. That’s not the case with multi-user MIMO (MU-MIMO), at least not with the first 802.11ac router to feature it. 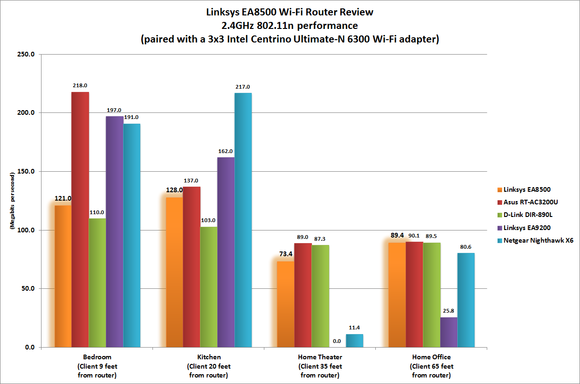 Linksys is positioning its EA8500 Max-Stream Wi-Fi AC2600 MU-MIMO Smart Wi-Fi router (don’t worry, I’ll just call it the EA8500 from here) one notch below its best offering. 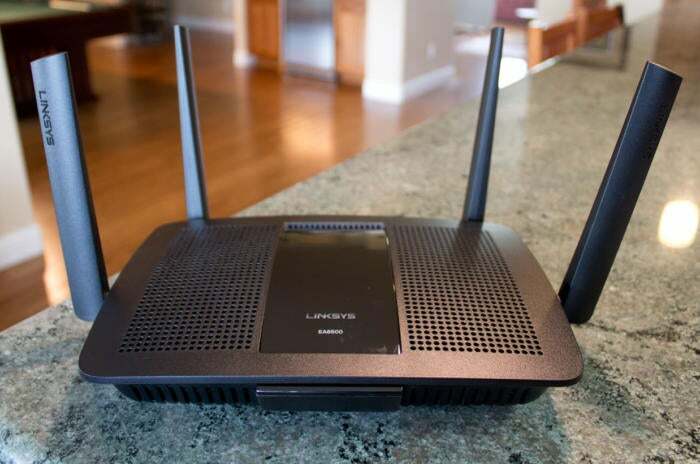 As you’ll learn from this review, that’s a wise move on Linksys’s part. MU-MIMO “ready” routers have been on the market for months, but the feature remains dormant in those products because the firmware needed to turn it on is yet to be released. The EA8500 is the first router to use Qualcomm's brand-new QCA9980 chipset, and its MU-MIMO capabilities are enabled right out of the box. Here’s a brief recap of MU-MIMO, if you haven’t heard of the technology: All previous 802.11ac (and 802.11n) routers have been SU-MIMO (single-user MIMO) devices, meaning they can service only one client at a time. When they need to service multiple clients, they divide time into thin slices and talk to each one in a round-robin fashion. Each client’s turn comes fast enough that you won’t to see the impact of this time slicing, unless several of the clients are performing latency-sensitive tasks such as streaming video. If those clients don’t buffer enough information, you could experience hiccups in the video streams. A MU-MIMO router can talk to all its clients without resorting to the round-robin trick. Because the various streams are never interrupted, you shouldn’t see any glitches even if several clients are streaming video. The Linksys EA8500 is the first router on the market with MU-MIMO capabilities that you can actually use. As you’ve probably guessed, however, MU-MIMO must be supported by both the router and the client in order for the technology to work. When paired with a SU-MIMO client—as almost every laptop, smartphone, tablet, and streaming device in the world is today—the router must go back to the round-robin technique. Because you can’t buy a product today that has an onboard MU-MIMO Wi-Fi adapter, Linksys provided us with three Dell Inspiron 13 laptops in which they replaced the stock Intel Wi-Fi adapters with Qualcomm MU-MIMO Wi-Fi adapters. I ran my first sets of benchmarks the way I always do, measuring TCP throughput using JPerf (the Java front-end to IPerf). I used an AVADirect gaming laptop with an integrated Intel Centrino Ultimate-N 6300 Wi-Fi adapter at one end, and a home-brew gaming desktop rig with a Broadcom NetXtreme gigabit Ethernet adapter (hardwired to the router) at the other end. To measure the effectiveness of MU-MIMO as implemented in the EA8500, I ran the same tests with the three Dell laptops paired to three other computers, streaming TCP traffic on all three client/server pairs simultaneously. I tested the three Dells the same way using an Asus RT-AC3200U to represent one of the best SU-MIMO alternatives to MU-MIMO: A tri-band router that operates two independent 802.11ac networks on the 5GHz band and a third independent network on the 2.4GHz band. I evaluate Wi-Fi routers by streaming TCP traffic from a desktop computer to a laptop computer in four locations within my home. 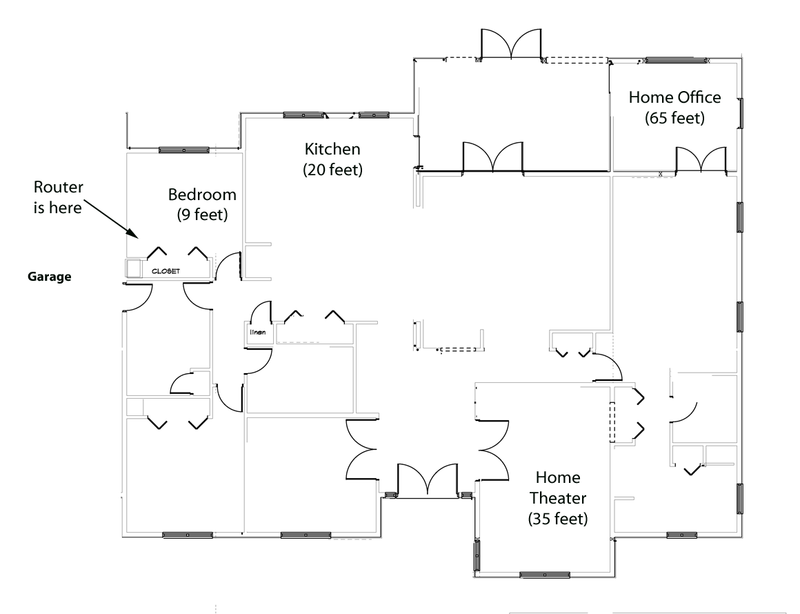 In most cases, I benchmarked performance at four locations: in the same room as the router, separated by 9 feet; in my kitchen, separated from the router by 20 feet and one insulated interior wall; in my home theater, a room-within-a-room design with double-thick insulated walls (and ceiling) that’s 35 feet from the router; and in my home office, which is 65 feet from the router and separated by two insulated interior walls. 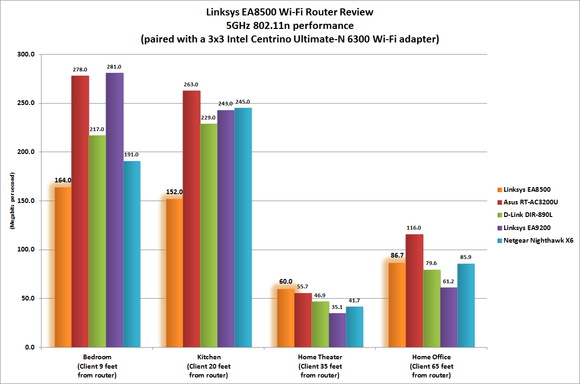 To determine which technology is best for serving multiple clients simultaneously, I compared the performance of the Linksys EA8500 paired with three MU-MIMO clients to the performance of the Asus RT-AC3200U paired with the same three MU-MIMO clients. 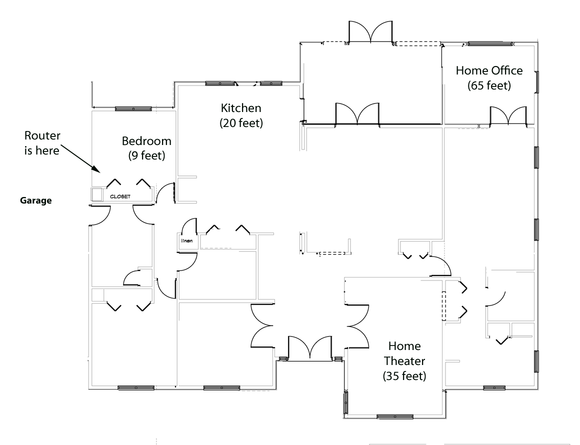 For each test, I put one client in the bedroom with the router, the second in the kitchen, and the third in my home office. I paired each of the clients with a separate server and initiated TCP streaming on all three pairs at the same time. By default, the RT-AC3200U broadcasts a single SSID for all three of its networks and automatically assigns each client to the frequency band and channels it thinks will deliver the best performance. You can override this and configure the router to broadcast three distinct SSIDs, so you can make the assignments yourself. 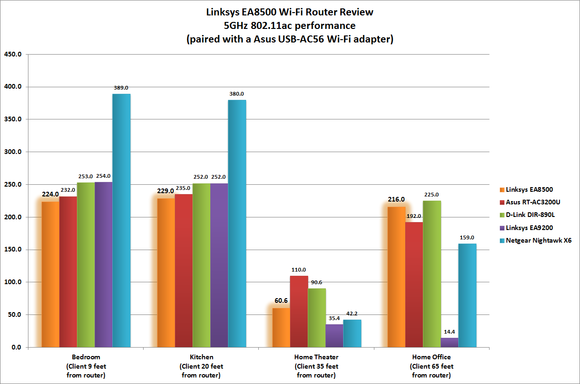 As you can see from the chart below, the Linksys router outperformed the Asus by a wide margin with the clients in the kitchen and home office, but it performed about the same with the client closest to the router. And that was only when I disabled the RT-AC3200’s auto-select feature and configured each of the three Dell clients to use the strongest 5GHz channels (153 plus 149). When I re-enabled that feature, the RT-AC3200 assigned the closest client to channels 153 plus 149 on the 5GHz band, the client in the kitchen to channels 36 plus 40 on the 5GHz band, and the client farthest from the router to channels 6 plus 10 on the 2.4GHz band. In this scenario the RT-AC3200 significantly outperformed the EA8500, probably because each client had a network all to itself. MU-MIMO relies in part on beam forming to deliver high throughput to each client, and it breaks down if all the clients are in close proximity. This shouldn’t be an issue in normal use, which is why I placed the three Dell laptops in distinctly separate locations for benchmarking. When all three clients were in the same room, one of the three grabbed the lion’s share of bandwidth, leaving the other two to starve. If you want to see the absolute best wireless performance that a router can deliver, configure a second identical router as a wireless bridge. When configured as a wireless bridge, you can use the router’s gigabit switch to hardwire four clients to get very high-speed connections to your network. Not every router can be configured this way, and not every manufacturer sends a second router for us to test this way. Linksys did send a second EA8500, and it performed very well at close range compared to the Netgear Nighthawk X4 (which Netgear classifies as an AC2350 router), the Asus RT-AC87U and the Linksys E8350 (AC2400 routers), and even the Netgear Nighthawk X6 (an AC3200 model). But the EA8500’s performance was positively anemic at longer range. The easiest way to update a notebook that doesn’t have an onboard 802.11ac adapter is to add a USB adapter. I’ve found the Asus USB-AC56 to be one of the best contenders in that space, so that’s what I used for my benchmarks with the AVADirect laptop. The EA8500's performance was decidedly average on this test. It’s very likely that your home still has a number of devices that can operate only on the 2.4GHz frequency band, so it’s important to know how any router can perform with those clients. This frequency can also sometimes deliver better range, although it has a tendency to get crowded. The EA8500 supports QAM-256 encoding, so it can support a maximum physical link rate of 800Mbps on 2.4GHz channels—as long as the client also supports it. I only measured 2.4GHz performance with Intel adapters, which do not. The EA8500 performed on par at range (when the client was furthest from the router), but it was in the back of the pack at the two closer locations. 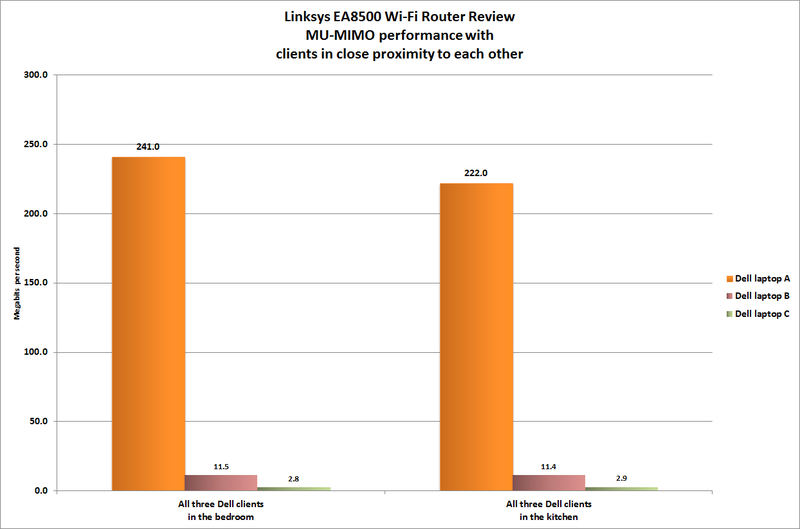 It’s equally likely that you’ll need to network legacy clients on a 5GHz 802.11n network. The EA8500’s performance disappointed here, with the notable exception of when the client was in my difficult-to-penetrate home theater. The router finished in first place on this test, although the gaps between first, second, and third place were negligible. Every high-end market on the router is equipped with a USB 3.0 port and at least a USB 2.0 port (the Linksys EA8500 has a USB 2.0/eSATA combo port). This enables you to share a storage device and a printer with all the computers on your network, and it can be a much cheaper alternative to a NAS box. Most people will care more about storage capacity than speed, but in order to remove the bottleneck that a mechanical drive presents, I’ve started using an SSD with a USB 3.0 interface to evaluate this aspect of a router’s performance. The EA8500’s performance on this score is unparalleled by any router I’ve tested. I perform four tests in all: I first move a single 10GB file from the SSD on my desktop computer that’s hardwired to the router to the SSD connected to the router, and then I move a 10GB collection of small files (MP3s, JPEGs, documents, and the like) from the desktop to the portable hard drive. These are write tests, because the files are being written to the SSD attached to the router. I then repeat the process, first moving the single 10GB file back from the portable SSD to the desktop, and then the 10GB collection of files from the portable SSD to the desktop. These are read tests, because the files are being read from the portable SSD and written to the SSD on the desktop. 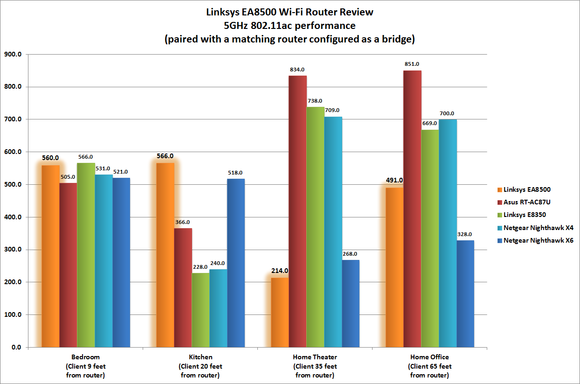 In all four tests, the EA8500 soared over the other four routers I compared it to, in some cases delivering quadruple the performance of the competition. Very impressive. Should you buy a Linksys EA8500? 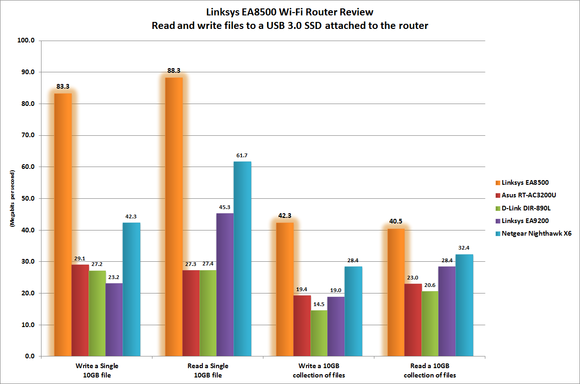 Given that there are no MU-MIMO 802.11ac client adapters (or smartphones or tablets, for that matter) on the market today, the biggest benefit you’ll get from a Linksys EA8500 today is phenomenal performance when sharing a USB hard drive over your network. You also get great performance with multiple clients hardwired to a second EA8500 configured as a wireless bridge. Apart from those two scenarios, you’ll get higher performance from an admittedly more expensive tri-band AC3200-class router, such as the Asus RT-AC3200U or the Netgear Nighthawk X6. Personally, I’ve been very satisfied with the Linksys WRT1900AC, even though it’s “only” a dual-band router; I’ve been using it in my own home network since it came to market. The latest and greatest isn’t always the best. I’m giving MU-MIMO some time to mature before giving it a "buy" recommendation. 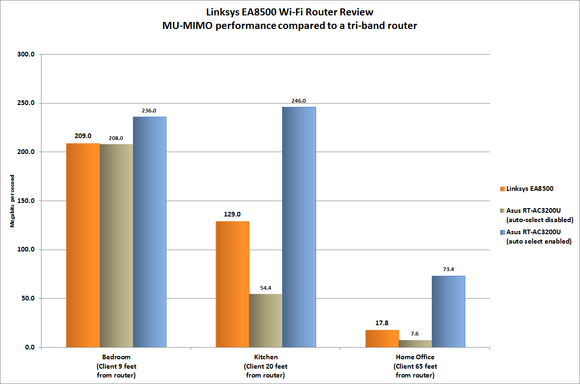 This story, "Linksys EA8500 Max-Stream Wi-Fi router review: MU-MIMO works (more or less)" was originally published by TechHive. It's too early in the MU-MIMO life cycle to buy a MU-MIMO router, but the EA8500 makes a fabulous host for a NAS drive.